This device lets you use any 48V PoE source (including Passive PoE, Telecom PoE, 802.3af and 802.3at) to power RouterBOARD devices. Simply plug any* 48V PoE powered ethernet cable into one port, and any 8-30V capable RouterBOARD device into the other. 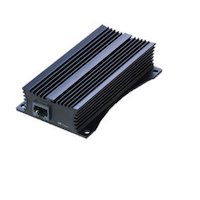 This device is capable to provide high power output - up to 24W (up to 1A at 24V).